Dr. Samuel Rhind, born c1830, and probably came to Saltaire around 1860. In 1867, he produced a medical report on Saltaire (to be found more fully in Balgarnie’s Salt (p171-173) for the Imperial Commision of the Paris Exhibition. This resulted in Sir Titus Salt being awarded the French Legion of Honour. Rhind had been born in Chelsea, in 1830 (+/- 1 year). [I would judge the photo to be of a man of about 40, so that it could have been taken around 1870]. The 1851 census shows him to be a 21 year-old medical student, living with his uncle in Chatham, Kent. He reportedly acquired qualifications: LRCP (Licentiate of the Royal College of Physicians), Edin; and MRCS (Member of the Royal College of Surgeons), London. By 1861 the 31 year-old Rhind was married with 3 children, and settled in Shipley. 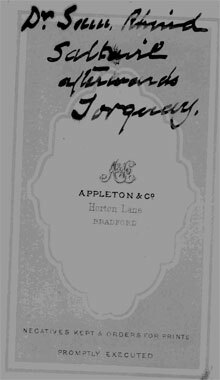 The youngest child – a daughter – is just 2 months old and had been born in the locality; the other two children (aged 2 and 3) had also been born in Yorkshire, but at Burley, so perhaps Rhind had taken up his Saltaire appointment around 1860. Judging by her absence from later census returns, the youngest child seems to have probably died in early childhood, presumably in Saltaire, which might be a poignant commentary on childhood fatalities. Rhind was still in the locality in 1871, living at 38, Saltaire Rd with his wife, son, daughter, and two servants. 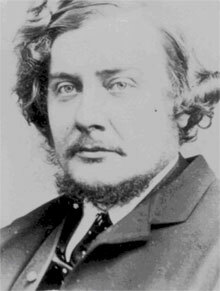 The CDV indicates that Rhind subsequently moved to Torquay; there is registration of the death of a Samuel Rhind in the second quarter of 1878 in Newton Abbott, Devon – just a few miles from Torquay. This pen-picture could no doubt be fleshed out by more comprehensive research (local papers, further census searching and BMD certificates etc). Rhind is quoted briefly in Samuel Smile’s Thrift, but that quotation is, in fact, an extract from the medical report made by Rhind to the Paris Exhibition in 1867, which is reproduced below, in full. Rhind’s medical report appears informed and well-balanced, save that in speaking of the beneficial proximity of the workers’ houses to the mill (thus minimising unhealthy exposure to adverse weather), he fails to acknowledge the fact that many workers at Salts Mill must have lived outside the township – particularly so in 1867, when not all the housing had been completed. Interestingly, in identifying phthisis as a still-prevalent disease, he is identifying the condition that had led to Fanny Salt’s death a few years earlier. It would be interesting to learn if his youngest child had died of the same disease. “High-class work and good wages have brought together a large number of first-class workpeople and mechanics, whilst the comfortable homes and houses provided for them have awakened, in the minds of the people, that home feeling which has led them to tastefully and neatly decorate their dwellings—a very sure sign of social happiness. Every medical man and visitor amongst the poor, very well knows how such things combine to prevent vice and disease, and how much they renovate and cheer the sick, give a higher tone, and tend to develop the mental stature of the people themselves. This is a most important point. A man in a dirty house is like a beggar in miserable clothing: he soon ceases to have self-respect, and when that is gone there is but little hope. In almost every house at Saltaire some form of musical instrument is found; and, indeed, the choral and glee societies, together with the bands, have become household names. A large number of the skilled workmen devote their leisure hours to scientific amusements such as Natural History, Taxidermy, the making of philosophical instruments, such as air pumps, models of working machinery, steam engines, and articles of domestic comfort, whilst some have even manufactured organs and other musical instruments. There is no public-house in Saltaire! Thus, with comfort­able houses and every inducement to stay at home—with literary and social institutions in their very midst, with high-class tastes, and, to crown all, a beautiful temple to the worship of God—it would be strange indeed had Saltaire not a reputation and a name. The erection of baths and wash-houses has been a great advance. Cleanliness is the great condition of health; whilst the removal of whole masses of damp clothes from the streets, and of the steam of washing-tubs from the houses, greatly conduces to the health and comfort of the inhabitants. Indoor washing is most pernicious, and a fruitful source of disease, especially to the young. The diseases peculiar to poverty are almost unknown in Saltaire, namely, typhus fever, rheumatic fever, and cutaneous affections. An accident infirmary and dispensary is erected, so that patients will be spared that great source of danger to life, hemorrhage, during the transit to a distant hospital. Hitherto there has not been a single death from this cause. The writer, from his medical duties, has been constantly in the town, day and night, and can bear testimony to the great absence of drunkenness; whilst in many of the houses no spirits are kept, except on the approach of a confinement. There is a remarkable absence of certain diseases. During the visitation of cholera to this country, a system of disinfecting and deodorising by means of the application of carbolic acid and chloride of lime to the drains, ashpits, privies, and sinks, was carried out. The carbolic acid was given to any one who would mix it with lime for the purpose of whitewashing. The result was remarkable; no case of cholera occurred, and even an immunity from typhoid fever and other autumnal diseases was experienced. Having thus drawn attention to the general moral and physical condition of the people, it will be well to look at the other side of the question, and mark the direction in which progress has still to be made. The prevalent diseases in manufacturing districts are typhus fever and phthisis; these are, therefore, the most common forms of serious ailment at Saltaire. To get rid of consumption from the disease list is almost, if not quite, impossible. Where persons of different temperament, constitu­tional vigour, and age, often carelessly clothed, leave home early in the morning, generally without partaking of food, and this in all kinds of weather and seasons, and that, too, in our irregular and often inclement northern climate, consumption must and will result. The question involved is rather one that rests upon the people themselves, than one in which masters can interfere. The workpeople can only be taught that warm clothing instead of finery, good food and regular hours, combined with home sanitary regula­tions, are necessary to keep down this terrible malady. Much is accomplished at Saltaire to prevent the disease by having the works erected close to the town, so that there is really no excuse for the workpeople going to their work in wet clothes; and, further, by the mills and sheds being thoroughly well lighted, warmed, and ventilated. With regard to typhoid fever, it is otherwise, although from this cause very few deaths have occurred. This is a disease which can be kept down by sanitary regulations. What pre­cautions, then, are necessary? (1) An absolute restriction to prevent overcrowding by lodgers in any one house. Let a proper number of cubic feet be allowed to each inmate, and on no pretence whatever ought this rule to be evaded. (2) A system of ventilation with which the inmates cannot interfere. Instances have occurred in which it has been purposely obstructed. (3) The system of drainage at Saltaire is thorough and com­plete. Bell-traps to sinks, if fixed, become choked; and if unfixed, are removed, and often lost. Syphons in the drains do not always prevent the back current from them. Where the nightsoil is preserved in ashpits, as at Saltaire, for agricultural purposes, a system is required for removing it without annoyance to the people. Recently an admirable plan has been adopted by which the inhabitants are compelled to empty their dust and ashes into the closets, so that the ordure is constantly mixed with that best of disinfectants, finely divided carbon and dry earthy matter. This ought everywhere to be done. Provision is made far the adoption of every sanitary improvement. A few of the lessons to be learned at Saltaire have been briefly pointed out, and, though others might be given, these will probably suffice”. Scholar in Anatomy and Physiology.